The Chiapan, Estaban Gómez Jiménez, imprisoned since 2013 and currently held in the Social Rehabilitation Center (Cereso) No. 14, El Amate, denounced in a communiqué that the state authorities of Chiapas have denied him a transfer to a prison near San Cristobal de las Casas, where he could be nearer to his family. “In September I called the technical area of human rights where I was denied a transfer where I could be close to my family in San Cristobal de las Casas, Chiapas; for this reason I ask for my freedom soon, I am asking the relevant authorities immediately, as it is explained to me all the time that we all have the right to defend ourselves and to be close to our visiting relatives,” wrote Gómez Jiménez. The campesino claims that his arrest was a police set-up, and that they accuse him of an assault and murder he never committed. 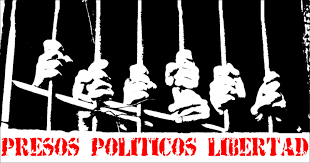 The prisoners’ support website, http://noestamostodxs.tk/, explains that the case of Esteban Gomez arises from an accusation by the Green Party member, Manuel Jimenez Moreno, from the Pamalha community, for which he was arrested, and they then started to accuse him of other crimes. The conflict in San Sebastián Bachajón, ejido adherent to the Sexta, has led to the death and arrest of several members of the community, like Juan Vázquez Gúzman, killed on 24th April, 2013 and Juan Carlos Gómez Silvano, coordinator of the adherents to the Sixth Declaration of the Lacandon Jungle, who was killed with 20 bullets in 2014. 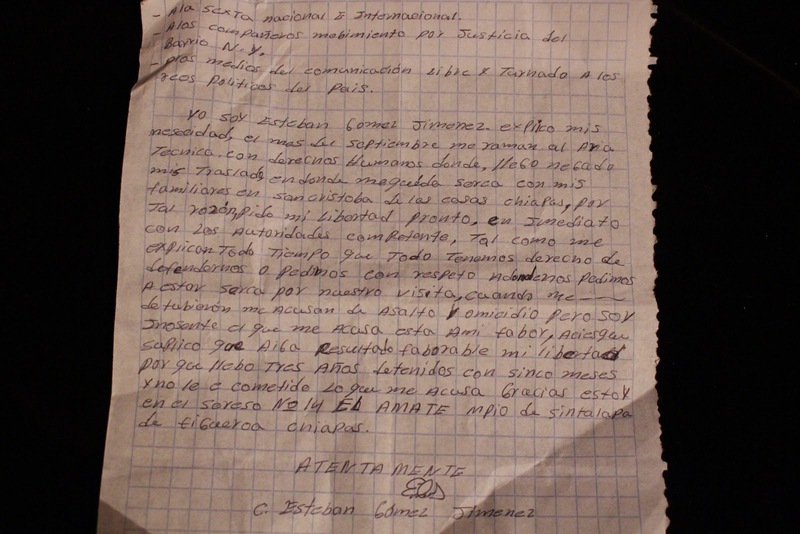 Currently, apart from Esteban Gómez Jiménez, also imprisoned are: Santiago Moreno Pérez and Emilio Jiménez Gómez, prisoners in Cereso 17, Playas de Catazajá. The Bachajón conflict began in 2007 when they learned of the economic development plans of the state government through the Palenque Integrally Planned Centre (CIPP), a network of megaprojects to attract tourism to the northern part of the state. The idea of the CIPP is to build hotels, a theme park, a golf course, shopping areas, residential lots, to which has been added the Palenque airport, inaugurated in 2014, and the San Cristobal-Palenque highway. All this infrastructure directly affects at least seven municipalities: Catazajá, Chilón, Ocosingo, Salto del Agua, Tumbalá and Palenque. The Tseltales of San Sebastián Bachajón are located at a crucial point in all this tourist business plan, where part of their lands were given to the government of Chiapas and the National Commission of Natural Protected Areas (CONANP), where they set up a toll booth on the common land on the border with the municipality of Tumbalá. In this context, explains an article on http://komanilel.org/, one of the strategies used to ensure territorial control has been the co-optation and intimidation of ejido authorities and the prosecution and targeted assassinations of those opposed to being dispossessed.